An average size Rogue River summer steelhead puts up a good fight in the near 3000 CFS water flow of July. Once again the bite came in the early afternoon after the water had warmed up a bit. The steelhead hit the Yellow Fork Tail Prince near near the end of a nymph and swing tactic. For some reason the steelhead bite really came on in the afternoon on July 19, 2017. The fish sure kept me busy with the hookups coming fast and furious. I managed to catch some of the action on video. The fish were hitting small stuff like G.R. Hare’s Ear, Prince and Pheasant Tail Nymphs. The small nymphs were fished as the dropper fly off of larger, heavier Carpetbagger Stonefly Nymphs. Oh, and I did manage to land a humdinger of a hatchery steelhead. Fillets for the table! Intruder flies for steelhead tied on 20 mm Waddington shanks. Fish on! 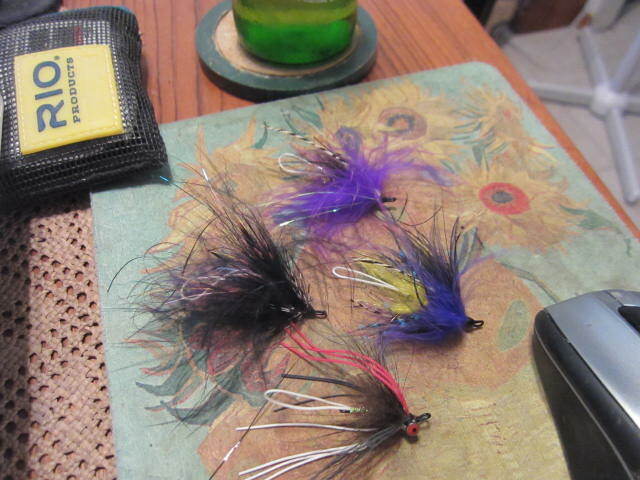 Steelhead Intruder patterns for Oregon, Alaska and beyond. Two for three today all on a size #14 Pheasant Tail Nymph (my tie). I’ll take that back. That big third steelhead which threw the hook after streaking across the river and then making a big leap, my have taken a size #8 Yellow Fork Tail Prince Nymph. Why? Because that is what I had on.